Boy we struggled with this for weeks now. Infoblox support and Microsoft couldn’t pinpoint the issue. changed our path from \boot\x86\wdsnbp.com to boot\\x86\\wdsnbp.com and WDS works great again. Thanks for this as well. FYI I am not sure why that trailing \00 would ever be necessary but perhaps you can enlighten. boot\\x86\\wdsnbp.com by itself for the boot file seems to do the trick. Useful post, thankfully I had a working system using IP helpers direct to SCCM an I was able to pint point the fault within an hour of troubleshooting, then it was down to google and this post to fix it. Thank you Thank you Thank you Thank you Thank you Thank you Thank you Thank you Thank you Thank you Thank you Thank you Thank you Thank you Thank you Thank you Thank you! I have been trying to figure out for 2 days why the hell my clients cant PXE boot from my WDS server. We use infoblox as well for DHCP. In infoblox, what are the DHCP options 66 and 67 suppose to be. 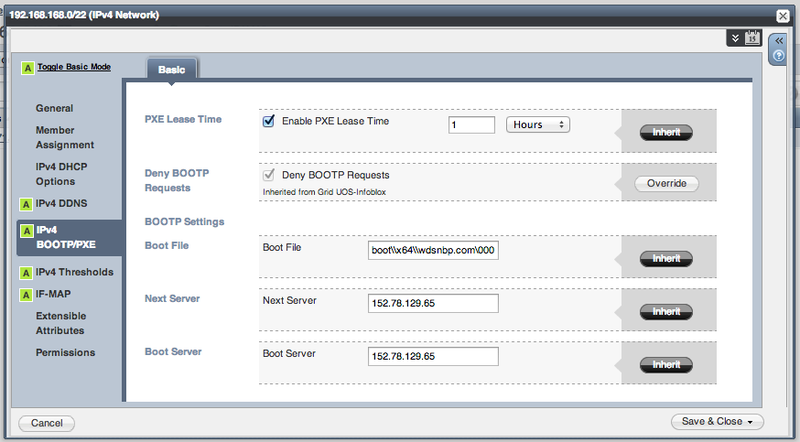 Sorry, new to infoblox and PXE booting. Options 66 and 67 allow you to network boot (usually network install) systems. Option 66 is the hostname (well, IP address) of the TFTP boot server, and Option 67 is the filename on the server of the executable to boot. if you could send a sample bootfile for a Linux tftp.